And yet, here I am, asking more of him. Not with regard to how he pitches when he pitches, – that would be ridiculous, look at those numbers – but the latter part of that phrase, the ‘when he pitches’ part, is something I am interested in seeing some adjustment back to the early part of the season. If he was more flexible with his usage he could be even more valuable to the team than he is currently. Up until the middle of June, John Farrell was using Kimbrel in ways that we had not previously seen him be used: multi-inning outings, entering in the eighth inning, only throwing the eighth inning, entering mid-inning with runners on-base. It appeared to (finally) be a move toward what the analytical baseball crowd has been yearning for, for years: use your best reliever in the game’s most important moments, not just in the ninth when they can get a save. The simplistic description of the idea is that Craig Kimbrel is the team’s best reliever, so he should be used to extinguish opposing team’s rallies at any point from (roughly) the seventh inning on (i.e., the high-leverage moments). Not sit and hope the other, lesser, pitchers hold the line until he can run in and end the game. Last year, we watched Terry Francona maximize Andrew Miller’s value down the stretch, into the playoffs and throughout this season, and Dave Roberts start doing something similar with Kenley Jansen last October that has carried over into this season. While it seemed as though Farrell and Kimbrel were heading down a similar path as Francona/Miller, Roberts/Jansen and others, over the last month Kimbrel’s usage has reverted to that of your bog-standard capital ‘C’ Closer. He has made ten appearances, with each lasting a single inning in the game’s final frame, excepting Saturday night’s blown save against the Yankees when he got the last out of the eighth. While Kimbrel set the pace for the team in average leverage for April and May (yes, Robby Scott had some huge moments), in June, Matt Barnes led the way, and so far in July, Joe Kelly has had by far the most difficult tasks. This is not an ideal situation. As with the lack-of-platooning, this is not meant as a criticism of John Farrell’s managing. Kimbrel’s change in usage was driven by Kimbrel. Even though what that statement means for how he is used frustrates me, I completely understand where Kimbrel is coming from. It really is all he knows. Of course he likes being the guy who gets the fireballs raging on the big screen as he runs in from the bullpen, and being the guy at the start of the handshake line after a win is sealed up. All of that stuff is incredibly rewarding, and has directly led to his being a very rich man. It reinforces that what he has been doing is correct. So I get it. It is terrifying to try a new thing when a certain thing (or sequence of things [e.g., unnecessary arm dangle]) has worked, and worked so ridiculously well, for so long. But here is another thing among all of these things: his ability to throw a baseball past an opposing batter is unlikely to change if he enters a game at 9:40pm or 10:00pm instead of 10:20pm. Just as it didn’t when he was asked to do so in the first couple of months of this season, again excepting this past Saturday night. It will require an adjustment to his current routine and I recognize that can feel uncomfortable, but, as we have seen with the fanfare and performance of Miller, Jansen, Felipe Rivero in Pittsburgh, and Chris Devenski in Houston, it works just fine and will come with similar levels of adulation and money (probably). To be clear, I am not asking for Kimbrel to increase his workload to match that of a mid-70s reliever who throws three innings each time out – Abraham’s story highlights how his workload is a clear concern. Rather, I am suggesting that it would be to the team’s advantage for him to be more flexible in when his workload is distributed, such that he is more effectively deployed. Even Kimbrel should want the Red Sox to stop giving Kelly/Barnes/Heath Hembree/whichever-eighth-inning-guy-they-trade-for the ball when the game is on the line prior to the ninth inning. Those are all fine pitchers, but they are not Craig Kimbrel. He should get the ball. 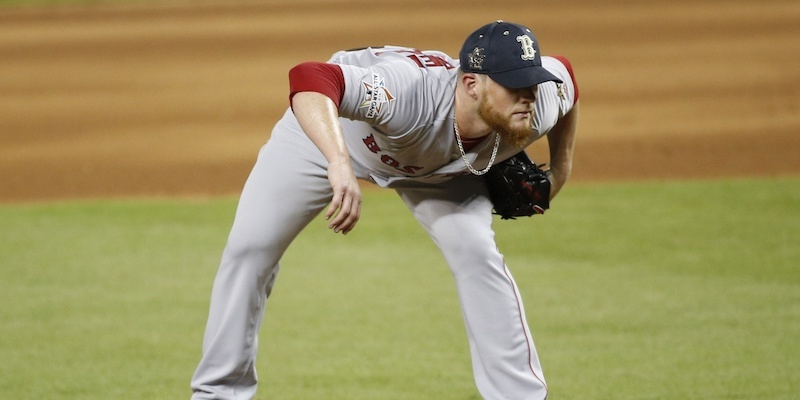 Kimbrel taking on a more flexible role could even adjust the team’s plans for the deadline. Who knows? But the whole thing is dependent on Kimbrel buying in to the concept and he seems unlikely to do so. That is the rub. Miller (and Francona and Cody Allen) bought in to the idea and stopped worrying about saves. Jansen (and Roberts) bought in. Even Aroldis Chapman bought in for a couple of months in order to earn a ring, but has since made an about face. Maybe someone should start hanging pictures of Miller and Jansen in Kimbrel’s locker every day. For what it’s worth, John Farrell seems to not want to push his star reliever into greater flexibility, saying in that Abraham article: “We arrived at a pretty defined approach and we need to adhere to that.”. You really don’t need to, John, but, again, I understand how it seems that way. There is the chance, remote as it may be, that Kimbrel will break if he is not used in the way he prefers. But the change I am suggesting does not even need to be all that drastic. Hell, it was somewhat in place for two-and-a-half months. And, at the All-Star Break, Kimbrel was 12th in FiveThirtyEight’s Goose Egg measure, which attempts to break the assessment of relief pitching from the tyranny of the save and credits pitchers for clutch, scoreless relief innings, even in tied games. But Kimbrel can, and should be higher than 12th. Manage to the Goose Egg? In any case, I wonder what will happen with Kimbrel’s usage if the standings are close in September. Will things change? The way this offense is going I suspect the team is going to need to eek out a few tight ball games. How about in October (if the Red Sox get there)? Will the adherence to a single-inning, ninth-inning role continue? I hope not. There is precedent for an angry Craig Kimbrel wanting the ball in a playoff game for more than just the ninth. Give in to your anger, Craig. In the end, while the status quo with Kimbrel is undoubtedly great, things could be even greater if he accommodates flexibility into his role and leads this team on a run through October.